It has been almost three years since the end of FeedDemon, but I’ve kept the Google Group for FeedDemon available for those who needed help. Legitimate questions posted to the group have slowed to a trickle, but the regular influx of spam that I have to moderate hasn’t abated. So I’ve decided it’s time to close the group. Rather than kill it outright, for now I’ve made it read-only just in case anyone could benefit from the information it contains. 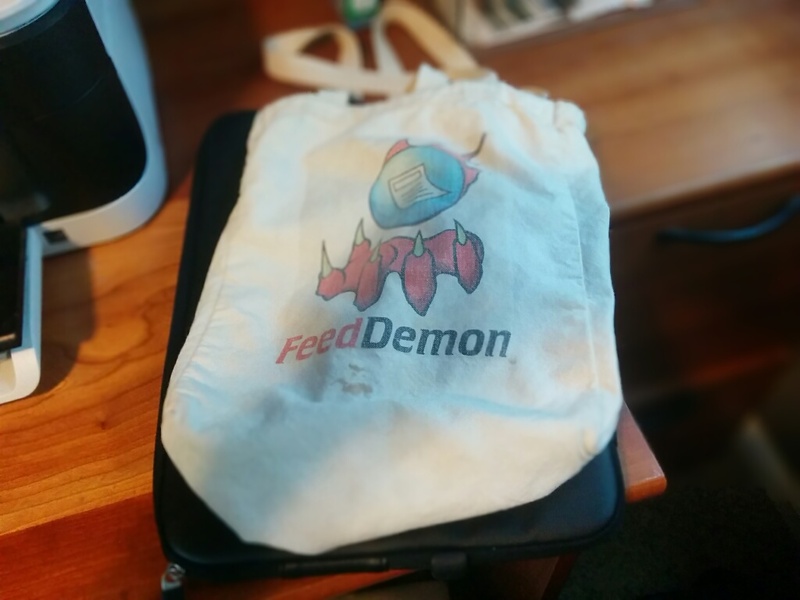 Years ago, when FeedDemon was thriving, I had a canvas FeedDemon bag created for me by CafePress. I figured it was a novelty, like having a t-shirt made from a picture of your kids when they’re young that you stop wearing once they outgrow the diaper stage. But instead this bag has remained my trusty companion and shows no signs of getting old. It has outlived FeedDemon itself. I’ve taken it everywhere, but I don’t think I’ve ever been asked about it. Probably for good reason: who wants to ask an obvious geek about their bag when it has a demonic logo on it? It has been on every vacation with me, carrying sunscreen, towels, and books to the beach. I’ve taken it on business trips to hold my electronics. It has come with me to the grocery store to carry home ice cream, veggies, and beer. Now it goes to the gym with me to hold my headphones, towel, water, and post-workout snack. It has survived storms, car wrecks, and even plane crashes. This is the Samuel L. Jackson of bags, and I wouldn’t be surprised if it lasts longer than I do. Shortly after the end of Google Reader was announced, I announced that FeedDemon was also coming to an end. My plan was to release a sync-deprived final version of FeedDemon – free of charge – before Google Reader disappears on July 1. That last, free version is now available. Here’s the download link. All of the features of the Pro version of FeedDemon are available in this release, and ads are no longer shown in the bottom left of the screen. As expected, this final version of FeedDemon does away with Google Reader synchronization. The first time you run it, all of your synched feeds will be converted to “local” feeds with no synching. Note that this won’t affect your actual Google Reader subscriptions – those will remain in Google Reader untouched. Because Google Reader identifies feed posts differently, you’ll likely see duplicated posts after upgrading to the new FeedDemon. This will resolve itself over a short time. My thanks to everyone who helped me keep FeedDemon going for so long – when I created it in 2003, I don’t think I would’ve believed it will still be around 10 years later! It’s been truly fun working on it, and I’m sad to see it go. PS: If you have a question about FeedDemon, rather than comment here please ask in the FeedDemon Support Group. Thanks! Since announcing the end of FeedDemon last week, I’ve been overwhelmed by the number of people who say they’re sad to see it go. Many of these people have told me they want to keep using it. So here’s what I’m going to do: sometime before the demise of Google Reader, I’ll release a new version of FeedDemon which no longer syncs with Google Reader. This version will be free, won’t contain any ads, and will have all of the features of the Pro version. You can use it free of charge for as long as you like – but it will be the last version of FeedDemon. It’s been impossible to respond to the many tweets asking me about open-sourcing FeedDemon, or making it sync with another service. So I’d like to address those questions here. First, open-sourcing FeedDemon sounds nice, but I don’t see it working. I use a number of commercial third-party components which can’t be open-sourced, and some of them are older versions that I’ve modified quite a bit. Perhaps more importantly, FeedDemon was developed in Delphi 7, which is very out of date. Delphi geeks will recall that version was released before the product supported Unicode, so all the Unicode support you see in FeedDemon was added by me (using owner draw, custom string routines, etc.). Long story short: it would be easier to write a new RSS reader than it would be to upgrade FeedDemon’s code to the latest Delphi version (which would need to be done). Second, switching to another sync service isn’t practical. It’s not as simple as just using a different set of endpoints for API calls, as some have suggested. No matter how close the new sync API is to Reader’s, there will be differences that require a lot of attention. Reliably syncing RSS feeds is a ton of work, and as I mentioned in my previous post, I already have a full-time job as an Android developer and just wouldn’t be able to devote extra time to switching sync platforms. I don’t take the end of FeedDemon lightly – after all, it has occupied a huge chunk of my life since I created it back in 2003. But I haven’t been able to give it any attention for quite some time, and it has earned very little for the past few years. Really, it’s time for me to let it go. PS: As expected, the end of both Google Reader and FeedDemon have brought a fresh round of articles saying “RSS is dead,” which is way off-base. Google Reader and FeedDemon represent the “old school” of RSS readers: they were designed for geeks and held little mass-market appeal as a result. There are plenty of popular “new school” feed readers with new approaches, and most of them don’t even call themselves RSS readers or even mention that they rely on RSS (which is a good thing, since most customers don’t care about the plumbing). This has been a busy week for me! Yesterday I announced the release of Glassboard 2.0, and today I’m announcing that a new version of FeedDemon is finally here. That’s the most noticeable difference in the new version, but under the hood it’s also faster than ever, and it fixes a number of problems customers have reported. A complete list of changes can be found in the release notes, or you can skip all that and download FeedDemon 4.1 now. Just install this new version directly on top of the previous version – there’s no need to uninstall first. While you’re here I hope you’ll check out Glassboard, an app designed for private sharing. I write the Android version of Glassboard.